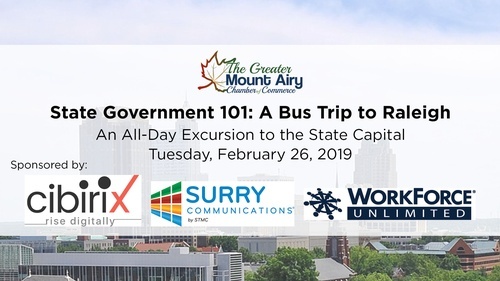 Join the Greater Mount Airy Chamber of Commerce on a one-day trip to the State Capital, Raleigh, NC. We know the actions of the state government impacts all citizens and businesses. This trip will be a good way to connect with our leaders in Raleigh and learn how the system works. 1pm, Lunch at the Daily Planet Café, one block from Legis. bldg., 121 W. Jones St.
Meeting Tuesday Morning: The bus will meet us at the Mount Airy City Hall, 300 S. Main St., Mount Airy, NC. This is a white granite building just past the Mount Airy Post Office, on South Main Street. Parking Your Vehicle: We have permission from the city to park our cars in the rear parking lot in the back of city hall. Please park your cars in the back portion of the lot, farthest away from city hall. Lock your cars. Departure: Please try to arrive between 7:45am and 8am. THE BUS WILL DEPART AT 8AM. Please note that we will not hold the bus more than a few minutes, past 8am. If you are delayed or you have to cancel, call Randy’s cell phone (336) 401-2875. Weather: This trip will take place rain or shine, be prepared. Attire: We recommend that business attire be worn for the day. There will be a fair amount of walking in Raleigh. Make sure you have comfortable shoes. Wifi / Outlets: Note that the bus will have free WIFI and outlets to plug in your phone, tablet or laptop. Snacks: The Chamber will provide some snacks, water and soft drinks for our time on the bus. Feel free to bring your breakfast with you. Security: Be advised that some the building we will enter will have security checkpoints and metal detectors. Photos: A Chamber staff member will be taking photos all day and we will share the pics with everyone. Promote Yourself: Bring your business cards and your business nametag. Lunch: We have arranged for lunch for our group at a restaurant (The Daily Planet Cafe) just one block from our meeting sites. The cost of the lunch is included in your ticket price and you can order from a large menu. Logo on all event marketing. Bus Departing from Mount Airy City Hall, 300 S. Main St., Mount Airy, NC.